These new projects ideas are a big hit with everyone. The best part is the materials that we use to make them are absolutely free. In fact, if I don't go to the local cabinet shop weekly, they end up throwing them away. 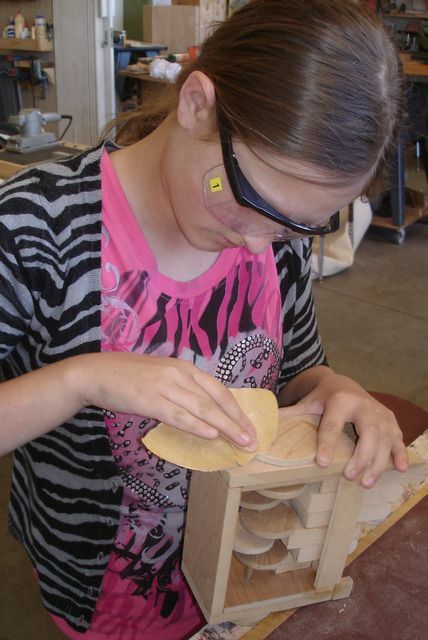 The lower elementary teachers tell me their kids can't wait until they can be in wood shop. I thought you might like to see one of our thumb pianos made with pieces from a lawn rake for the tines. Two of the teachers brought in old rakes and they really make this instrument sound good. I wish I had access to hundreds of old rusty rakes. 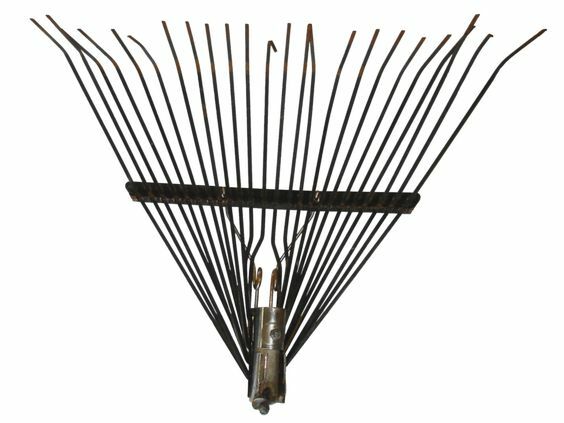 Anyone out there willing to send the tines off of old rakes? We could use any and all that we can get. Right now I've limited their use to the youngest kids because they are the most likely ones to have a difficult time hammering out the coat hangers. The best sounding thumb piano we can make. ***UPDATE*** Spring break score... as found on the highway, this lawn rake head must have fallen from someones truck. I had to tell my daughter to pull over so I could run out and get it. 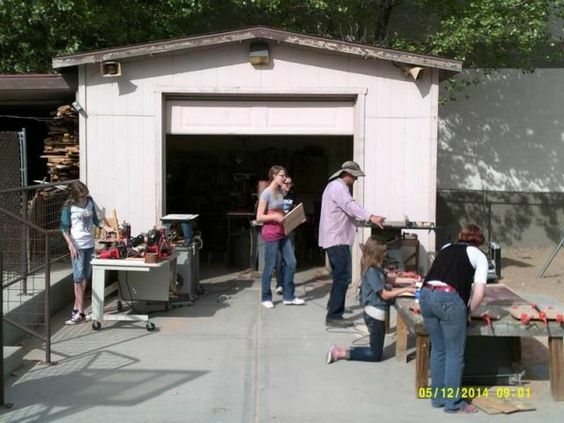 Then when I got back from spring break, there was another at my shop door, donated because we had advertised in the newsletter... "old lawn rakes needed for wood shop thumb pianos". I wish I could find a hundred more just like it. They make the perfect thumb piano tines. Sorry the background was too difficult to remove. It would be easier if I had taken the time to paint them before taking the photo because better contrast makes removing the background much easier. Yearbook has been out taking photos and posting some of them here and here. I'm glad they are doing this because the kids are taking their projects home too fast for me to able to keep up with it. Keep in mind... we don't have a shop fee... everything we make is scrap from the cabinet shop... including sandpaper. I haven't purchased any wood. 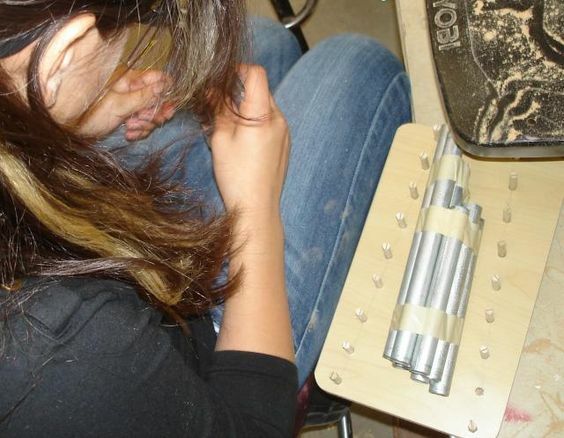 I did use clothes pins for the trigger on the ping pong launcher. 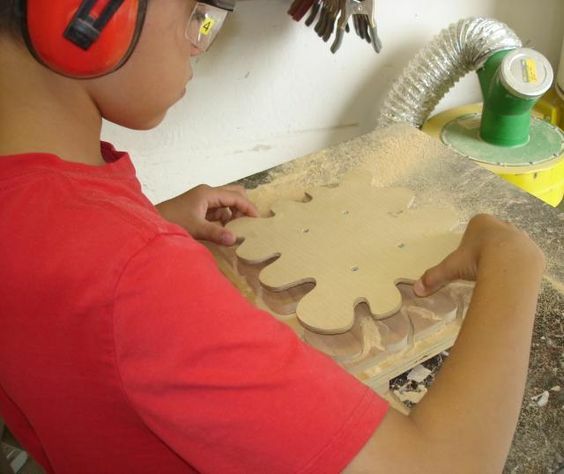 The cutting boards are being developed into a fundraiser for the eighth grade trip to Disneyland (next week). In fact, more than half of them have already been sold. The school is also considering adding pens and tissue box covers to the fundraising next year. Last day of school here is May 21st. The photos are slowly getting posted on the school website (our IT guy is also a teacher's aide) so check back periodically. I'm letting other teachers choose what student work to photograph and post. One of our teachers is completely crazy... for horses that is. Being brought up in rural Arizona can do that to people. She collects everything horse related... and absolutely went nuts over the Pegasus whirligig, so I told her to ask one of her students to make her one. This gives me a perfect opportunity to make a test run and work out the kinks of a student building the project. She chose a most capable student, a 7th grader we share and the project went right together (working in between all his pen projects) until we got to mounting the wings. I just can't see spending a fortune on hardware just to save a little on using free scrap, so we came up with a simpler method of using a short wood block instead of all-thread. It goes through a notch and has grooves to keep it secure. Add one screw and washer on each side and it works perfectly. A few days later I showed up with the jumping horse book ends, and the folk art horse, but times up. She has to patiently wait until next year and all the sad looks in the world won't make time go any faster. (pg 1, pg 2, pg 3) and the ping pong popper. They can also be accessed by going back to page one because I added them to each appropriate post. I'm going for variety here. It's made from 4 layers of 1/2" MDF. I'll take it to class tomorrow and let you know the verdict. Only two half days remain and one is the carnival. ***Update*** It was a really big hit today. ***UPDATE*** Here is one of the first to be cut and sanded. ***UPDATE*** Late October... This project has turned out to be much more popular than I ever imagined. One of the 7th grade girls has decided to try and produce a dolphin bank. It's beginning to look like a pretty good idea too. I'll keep you posted on the progress. The school would like to hand these out with graduation photos next year. Actually, they would have liked to have had them this year, but it would have taken too long to accomplish, so today I made up a jig set that will allow them to be mass produced. If the school isn't planning for it to be a surprise, the students might even be able to paint the frames whatever color they choose. How this works.... The frame blank gets sandwiched between the cutting template and the jig platform. The platform is raised 1/2" leaving space underneath so the dust and chips are drawn into the exhaust system where the jig is attached. 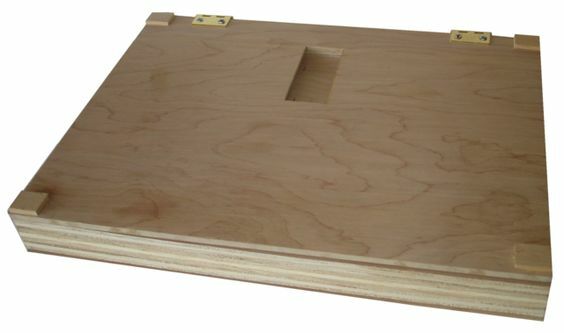 It is the same quick release system as all the other router templates, using a simple groove in the router table. 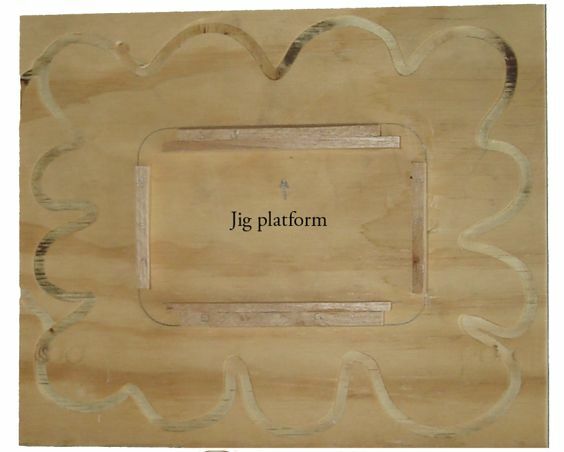 Other shapes of routing jigs can be made to fit the frame blanks. 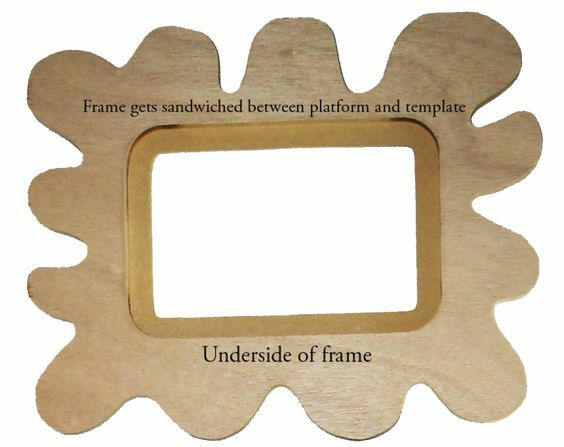 The frame below has already been cut to shape. The rabbet in the frame blank fits over the pieces in the middle of the platform. 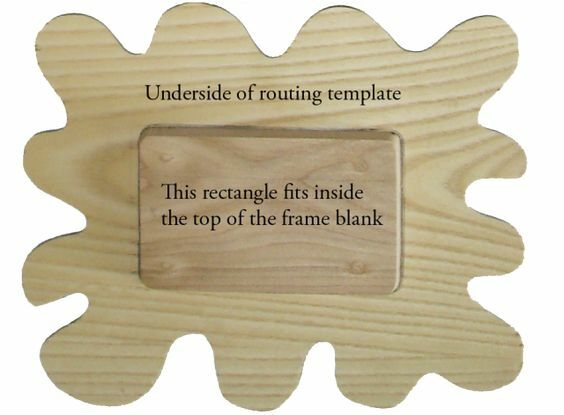 The routing template below fits into the frame blanks photo opening and keeps everything straight during the routing operation. I realized that the frame and template are turned different ways when I took the photo, but it's not as difficult to line them up as it might seem. It's a matter of seeing the writing I've placed on the photos right side up. Sorry, even that description seems a little vague so I added another photo showing everything sandwiched together with the frame already trimmed by the router. 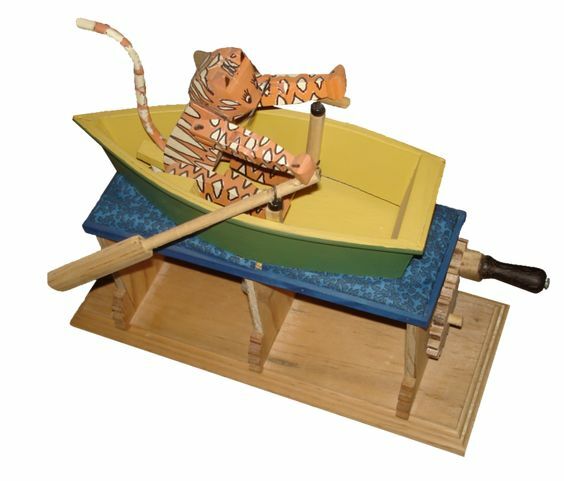 Franklin Phonetic School places a strong emphasis on fine art and music as part of their traditional curriculum, so I'm always looking for ways to bring fine art and music into woodworking. 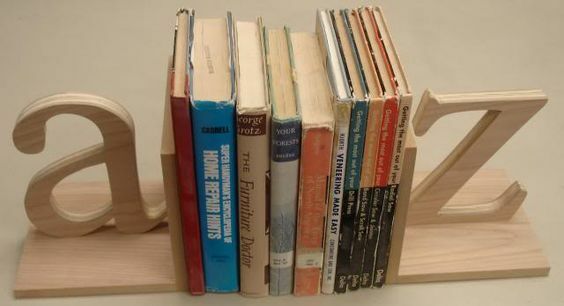 I found this project idea during a Google search and it is perfect for the younger age groups that come through wood shop. Let me know if you are aware of any other projects like this. I'd love to have other music related projects. The template for this project can be downloaded here. ***UPDATE***I get a big kick out of the middle school kids. They really go for the musical instruments and I often have to tell them to settle down when they are looking through the projects because they will invariably want to form a band and play the xylophone, thumb piano, slot drum, train whistle, and alligator percussion all at the same time. It actually doesn't sound too bad, it's just that we are currently meeting (for our safety talk and slides) in a small math room until our new space is completed. ***UPDATE*** It's almost October and I don't force the kids to do any particular project. I try to let the project motivate them... and for the most part, that works so well I never have to scold anyone. Of course there is always one or two that eventually let on that they don't like wood shop. Really.... what's not to like about wood shop? At least that was what happened with a couple of students last year. A few simple adjustments and they were quickly back on track. They eventually made some nice pieces before the end of the year and some of them actually improved in their other classes too. A few parents came by to tell me it was because of my class that their child began liking school. 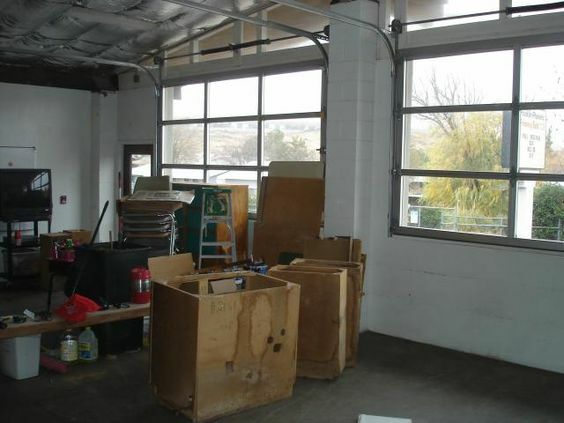 We still work out of a small garage, (spread to the outside) but will be moving into the old cafeteria. It has taken longer than I expected, but it really looks as if it's going to happen by fall break. Yep... that's me in my big hat and long sleeves trying to keep the sun at bay. It's early December! The new cafeteria remodel took longer than expected. I should have been in my new space last year, then fall break this year, but here it is right now... a before photo. The old cafeteria is becoming the new wood shop. I was in there removing the old kitchen cabinets just the other day. This view is out the front near our parent pick up. Everyone will see the wood shop when they come to the school and these doors will be nice to open when the weather warms up again. The total indoor space is probably four times what I'm currently using. The plan calls for an accordion door to separate the space for more flexible use. I'm trying to put everything I can on wheels so it can be rolled back and closed off if the space is ever needed as a staging area during plays or concerts. For the most part, I'm told the accordion doors can remain open and the shop spread out. Unless you've worked in cramped quarters before, you will never know how nice it will feel to be able to spread out and always be indoors. I also have come up with an idea for fold down wall mounted scroll saws. More about that later. ***UPDATE*** Here is a short cut if you would like to skip up to the new shop (Page 3 Panel 60). All I have to do is substitute in any academic class to see how difficult it is for most teachers to motivate their students in their subject. 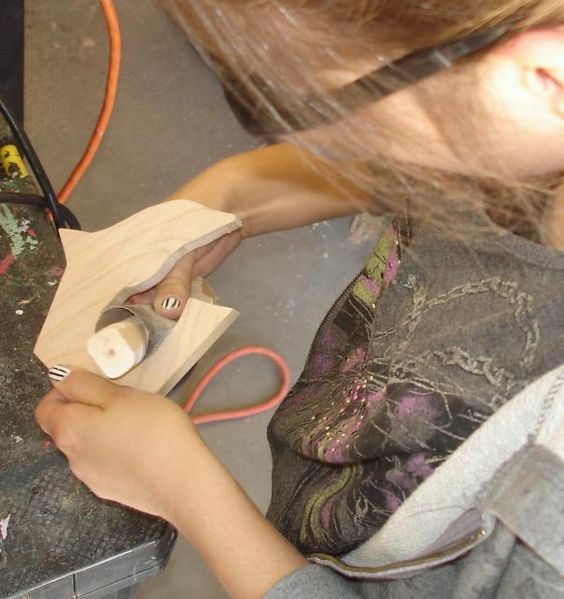 It's easy to see that motivating students is so much easier in wood shop. When I substitute, I also get to meet the students who want to be in wood shop but for what ever reason, it isn't possible to get it into their schedule. This antique piggy cutting board (1/4" MDF) template was made using this pattern (download) from a photo I found on a museum site during a Google search, except one of our office staff said she thought it looked a little small to be a cutting board... so I decided to cut the paper pattern in both directions and added a little strip (about 1" extra in both directions) to make the template large enough for our purposes (up to 12" x 16"). 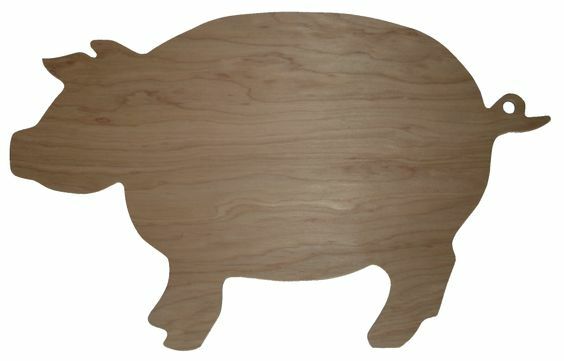 These other cute piggy patterns (pattern 1) (pattern 3) were also made in photoshop using Internet photos of antique cutting boards from museums. All the patterns/templates were too large to scan. By the time I got around to getting a prototype made in December, the tail changed a little. I like this one better and so do the students. It has become very popular. ***UPDATE***Our small planer can cut 12" wide. I usually make the cabinet shop scraps 16" long. The students pick through the scraps. One of the cutting boards made to sell for last years 8th grade trip. ***UPDATE***This is a 4th graders finished cutting board. There have been more positive feedback/comments about the cutting boards project than anything else we have done... which really amazes me because something so simple generates so much buzz. When I sent out a flash drive filled with curriculum last week I didn't even think to include these projects. I know it's mostly a high school curriculum, but middle school can also benefit from having the curriculum, and I will have to add the middle school project materials before sending out any more. 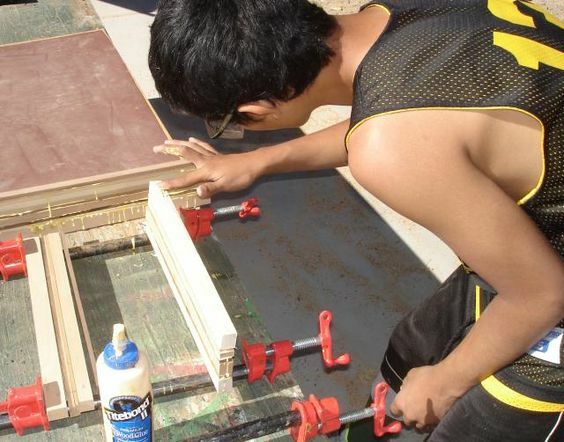 I could have used many of these projects with high school beginning woods students. ***Last week of October***... This 6th grader custom made an impressively large cutting board for her mom who not only provided the specifications, but is also one of our 4th grade teachers. Thank goodness the cabinet shop sometimes gives us long enough pieces for one this size. Made in halves so it will fit the small planer, there remains only one seam to sand before cutting it to final size. 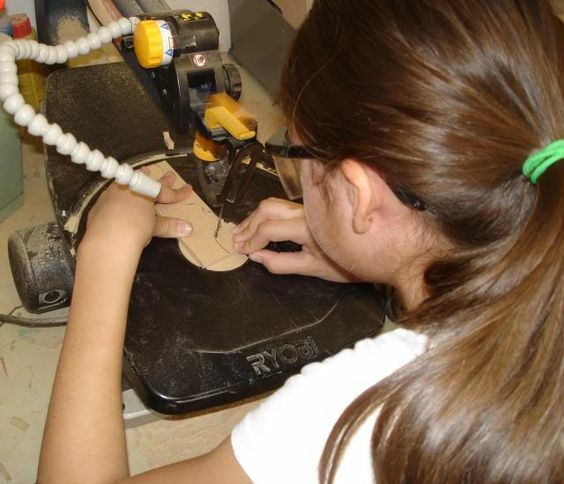 A 6th grader works on her cutting board. The idea for this project is to use up what I have.... and that is an abundance of donated 1/4" panel material and an existing frame set up. I usually run short on the 1/2" and 3/4" we normally make our frames from, and this will be further stressed by making the various bookends next year. 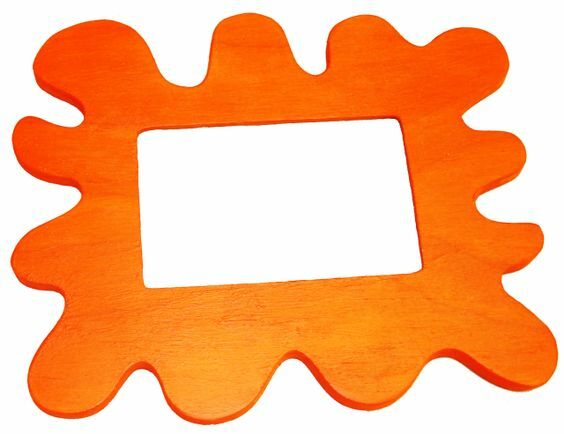 This Father's day photo frame is made from 1/4" material. If I still had access to a laser engraver, the lettering would look better. However, without the laser, a simple sharpie isn't too bad. If I had the time, I could have hand routed the lettering. 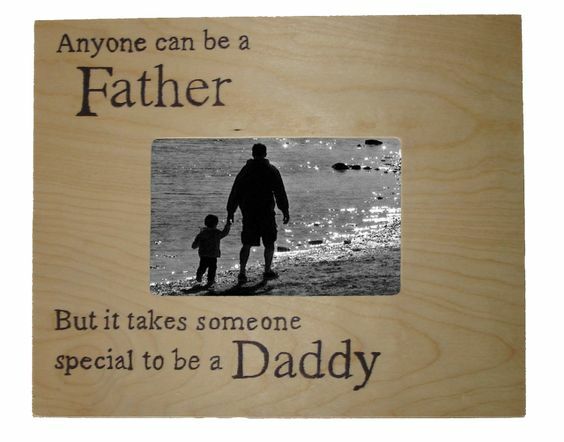 The photo of the father and son by the water was photo shopped into the frame. If you are interested in knowing more about laser engraving.... go here for some great video links. The reverse side (photo below) is built up with a simple softwood backer frame around the photo opening with a (drilled) hanger hole. 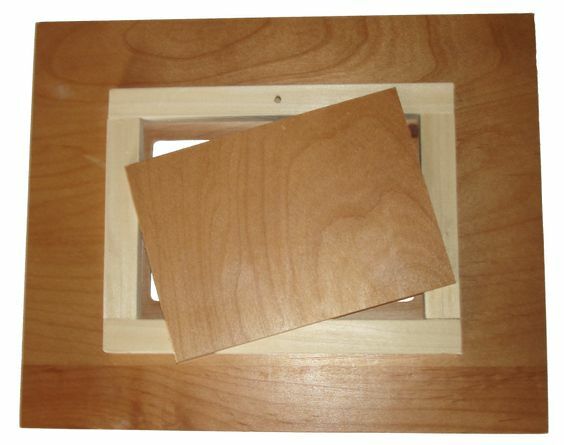 This backer creates the rabbet as well as frame depth by holding the frame about 1/2" out from the wall casting a shadow on the wall when the photo frame is hung. Mid-October... I know if there was easy access to a laser engraver, that this project would be more popular. Late March... This has not been a popular project probably because of the lettering without a laser engraver. Give me a laser and it would change everything. Added in April... It might become more popular if we could secure a hot wire wood burning tool. American Woodturner Magazine, page 13.... Yahoo... a national publication highlights Franklin Phonetics woodshop! This link has been updated to show the actual magazine. If you go to the viewer, the page numbers shown at the top don't reflect the actual page in the magazine, but if you put in 15 and press enter, it will go to the top of page 13. Scroll down and you will see the article. As I was looking for ideas, I came across this animated man whirligig video on you tube a few weeks ago and thought how cool is this, but I would need to simplify it enough to have 7th and 8th graders be able to make it. With out looking at the video again I started making a jointed man today. I've made them before and they are quite easy, but when I got the body together and tried to make it move in a similar way as what I remembered seeing on the video, it was a little too animated. I looked up the video again and noticed the man was even simpler than I remembered, so I tried again. This time the arms, legs and ankle joints are stiff. After I started playing around with the idea I realized our wind around here would tear it apart. I would need to gear it down. 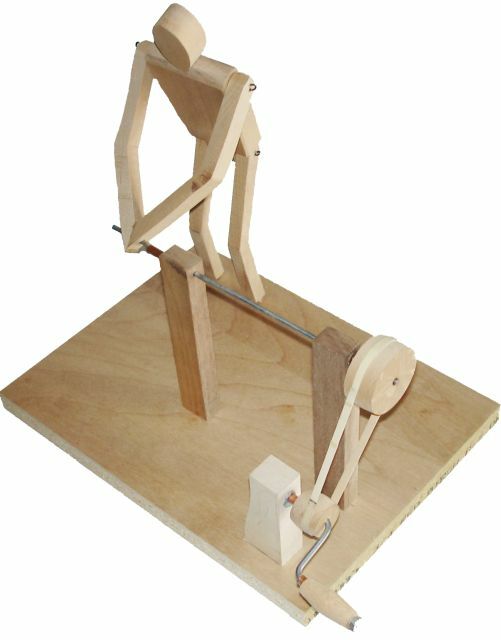 Gears aren't hard for me, but can be for the students, so I started making pulleys and changed it from a whirligig to an automata. The belt is a simple rubber band (later switched to a vacuum belt). When school starts again I will be able to tell if the students can get serious about tackling something like this. ***UPDATE*** Last week of October... 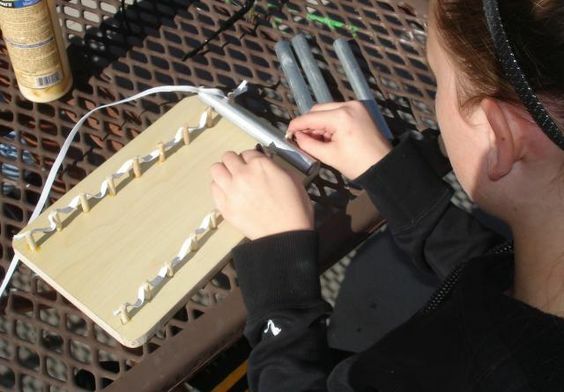 This project has fascinated a ton of students who now have enough skills to attempt it. I've updated mine (back ground) with a vacuum cleaner belt. The students have to help make these templates since I haven't had time to prepare them myself. Notice this 7th grader already added a home made black & white stripe neck scarf for her little guy. There is promise of also adding a hat but I never saw it. With the hip joint completed, it's on to making the arms next. She was the first to nick name him the "cranky man", a name that better describes this project. This student made our first "Cranky man". ***Early November*** At least one student was enamored with the original mechanical man, so he made one for himself (See photo below). After spending most of the semester on it, he said it is harder to make than it looks. Designing new project ideas is always a hit and miss proposition and you just never know which project is going to hit big. Now it's early December and after other students have seen his mechanical man, they all want one too. I didn't think this project would get much traction and end up keeping so many eighth graders interested even though it can be complicated and tedious. Our first completed animated man. The example I made today is from 3/4", 1/2" and 1/4" donated MDF sheet scraps. 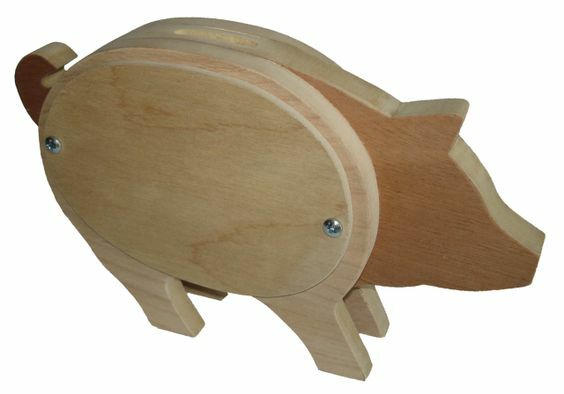 ***UPDATE*** The test student completed this scroll saw piggy bank project today 6-25 while her brother made a tissue box cover and then cut his dogs names out of walnut on the scroll saw. She is currently between 2nd and 3rd grade and he is between 8th and 9th grade. All the projects came out beautifully. ***UPDATE*** Late September... Gluing the piggy bank... the young man working on this piggy bank can cut along the lines better than I can do it. He shows true patience. I'm so impressed at what all the students are able to do. Even the students who have difficulty at first, seem to be getting it with practice, which is something I've been telling them all along. It's not a race. The better you cut, the less sanding you end up having to do. Clamping the piggy bank. Here is where the wire through the alignment holes comes in handy, keeping everything from sliding when you tighten up the clamps. Screwing on the sides. This fills the alignment holes while holding on the sides. Some of the students ask me how to get the money out. Simply take out a screw and slide open the side. ***UPDATE*** Late October... The slot was just cut into the top of this recently completed piggy bank. With the sides installed and painted, it's ready to go home to mom. I kept thinking I should try to reproduce the Garfield bank today, but instead I decided to do something a little different... a dinosaur bank. I saw something a little like this when I Googled piggy banks, except their example was more cartoonish and painted red. This project will require some patience and a lot of scroll work. Just to let you know, the photo doesn't do this project justice. I guess you could say that about most of the photos on this thread. Nothing beats inspecting objects in person. Also, after the students start working on these projects, we often find simpler ways of doing things and the projects (and procedures) change a little. To keep up with that, I have a couple of students (kids of a former student) come over about once a week to test new ideas. One is going into third grade and the other is going on to start high school next year. Here is why template 1 says to make 2 pieces... The dinosaur has fins (or scales) running down it's back making a normal coin slot difficult to reach. I recently went back and added a coin chimney. It no longer fits on the scanner so I haven't included a revised template. Contact me if you want me to scan the coin chimney so you can cut it out and fit it on to template 1. To rout the coin slot, I made a jig (that reminds me of a laptop computer that opens a lid from both the top and bottom). 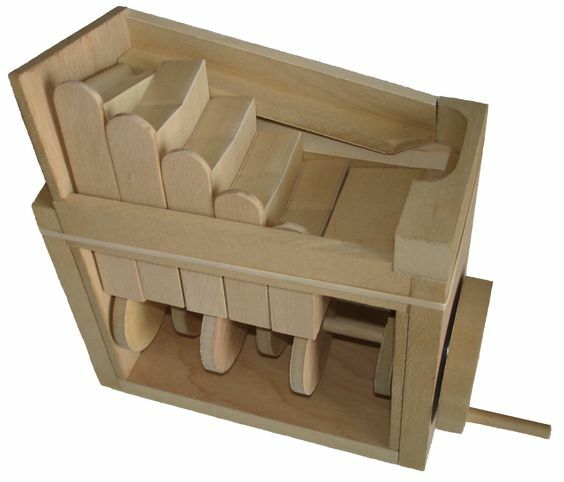 Each lid has a rectangular opening for routing the coin slot, allowing the student to insert both halves of the center pieces (left and right) into the appropriate side. Each half of the coin slot requires flipping the jig to that side so the slot can be routed. Once assembled, the coin slot should let any size coin roll through. ***UPDATE*** Late March and only a few brave souls have attempted this beast. 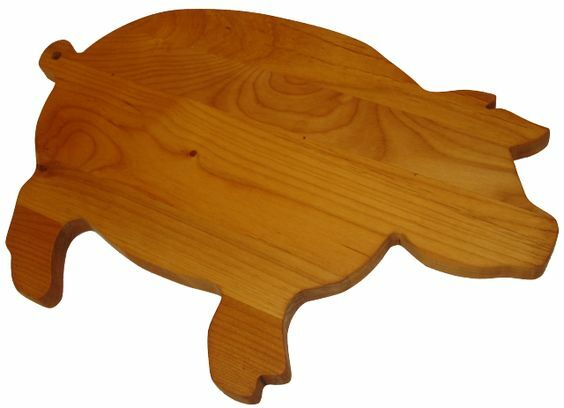 It's a real hair raiser on the scroll saw, and no.... I haven't always remembered to photograph it when students are working, but I do have these photos. 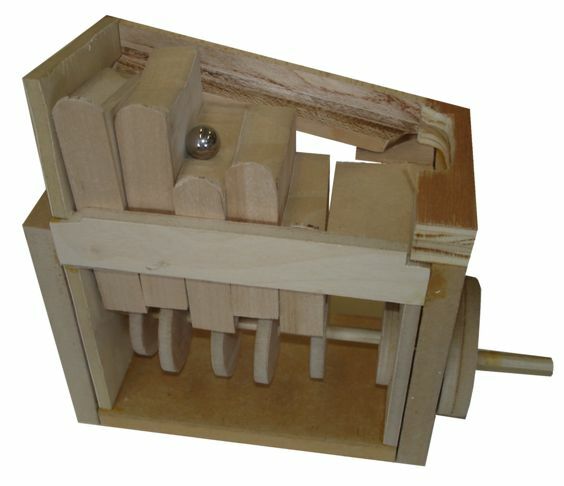 The coin chimney slot jig opens on both front and back making both left and right sides for the finished slot. Inside the jig are two nails for the registration holes drilled in the project sides. A closer look reveals a pencil line to show students which direction the side goes. 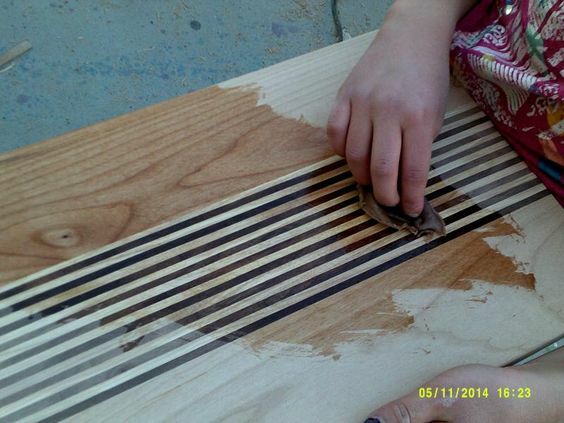 Slip the side onto the nails to hold the side in position for routing. When the jig is closed, the opening on the top is where the router is placed when students rout each half 1/16" deep. When the halves are assembled together, the slots should line up to each other. The 7th grader completes the dinosaur bank. I was cleaning home shop today in preparation for my summer test students to come make a few of these projects when I went under the table saw extension table to vacuum and remembered that this is a good project for high school students... a tilting router lift. I thought you might like to know about this project. I was telling a friend that I was going to attempt to make one of these just from the photos and other information I could find on the Internet and he said he would buy the plans (about $14) and materials (maybe $50) if I would make him one too. It is money and time well spent since I have now made about six of these. The last four were made only with free scraps and free misc collected hardware. Now that I have had the experience, I've concluded that there's no reason to follow the plan so closely as to cost anyone any money other than buying the plan. OK, maybe having a t-nut and some threaded rod might be a problem, but you shouldn't need much if you keep a little extra hardware around like I do. 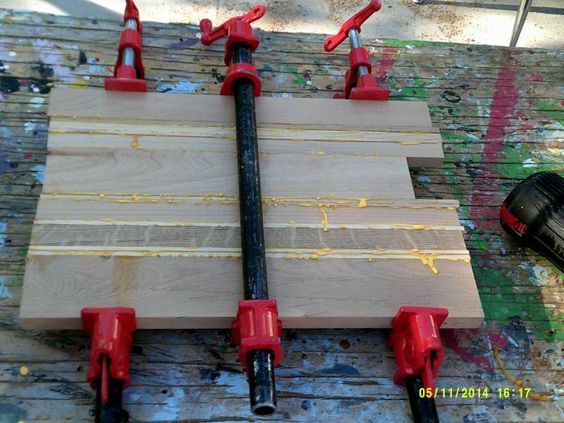 One threaded rod will make three or more router lifts if you are careful. I collect scrap wood all the time. I get free bearings from a guy who recycles small power tools, but old skate bearings work great too. I added an extra bearing to mine, putting one both on the front and the back of the front gear, which makes it run really smoothly. New bearings at the hardware stores around here cost about $10 each. A skate shop sold me eight for $12. It pays to think and look around to see what you can find. This router lift was easy and fun to make and has worked out so well that I have one for use on our schools Ryobi router table too. The plan is easy to follow, can fit any full size router and can easily be modified for smaller routers. I crank the bit right out of the table top and change it without hassle. I paid a bunch for a store bought router lift at my last school and I wouldn't go back to that old router lift if you paid me. It got full of dust and chips all the time and was hard to adjust quickly with that table top crank. Getting it up out of the table so it could be changed took too much time. After mounting mine under the extension table, I mounted one of those rectangular plastic storage tubs to the underside of the table. Three hooks hold it in place. It pivots down when you release one hook at the front so you can access the router lift. I mounted an exhaust unit under my saw with the collection bag under the router lift. It keeps the saw clear of saw dust and a separate hose can be quickly placed so the plastic tub becomes a vacuum to clear out the chips as you use the router. The vacuum, as well as the expanded exhaust system bag, holds the plastic tub tight to the underside of the extension table. The tablesaw fence doubles as a router table fence. 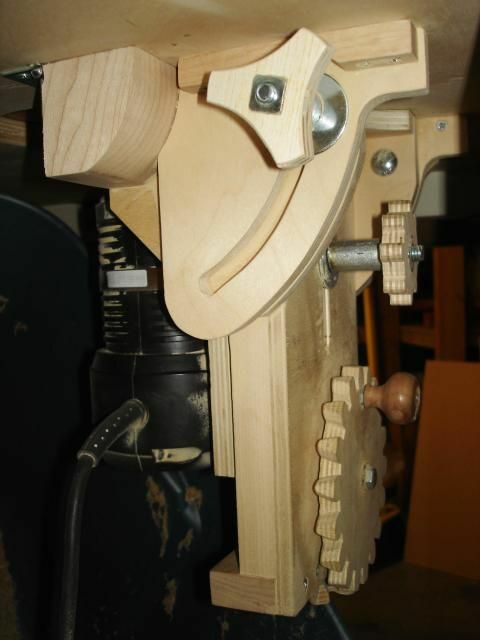 When I use my Porter Cable router, I also use the eliminator quick release router chuck. This router chuck has a whole story too. 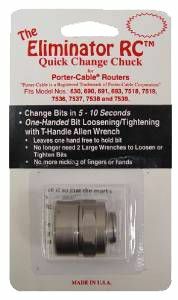 After my student Lindsey Dill was featured in American Woodworker Magazine, the inventor/owner of the eliminator called me and said he was so impressed by the magazine article that wanted to send me one of these quick release chucks for my porter cable router. He went on to further tell me he left school after grade six (if I remember correctly), and went on to start and has been successful with his own machining company. At first I was on guard and thought it was a sales gimmick, but he actually followed through and sent one to me absolutely free just like he said he would. It was right before summer and I set it aside. The following school year I came in to get the shop set up and saw this package still sitting on my desk, so I opened it up and installed it on a router. WOW... what a great devise. He told me to tell the students not to over tighten it, so we worked out a routine, twist off, twist on and don't move it any further than you have to. What a time saver this is. I had to go back and search for the original package so I could call him and beg him to sell me six more for all my routers. He did, and at a huge discount over what they cost from a catalog. I'll be forever grateful to him for not only being honest, but also for developing something so cool and then deciding to ultimately contact me and share it with my students. 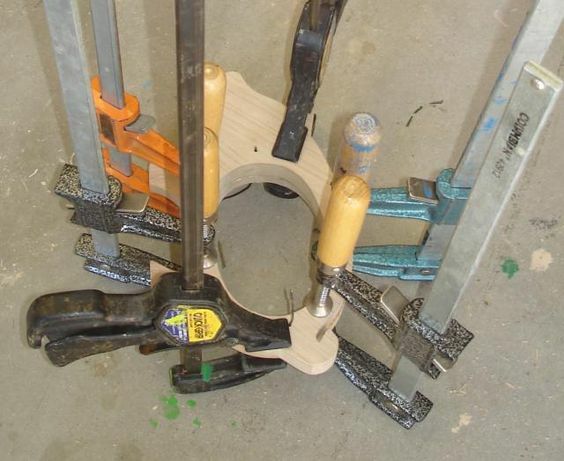 To save shop space, I loaned my old router table with a new router lift to my school where we use it almost every day. With that one, I modified it so the router can come completely out the top of the router table which makes everything easier to clean. I also added an auxiliary table which quickly sets up or removes from the top. It holds all the routing jigs you have seen in this thread. The plans and information about this router lift can be found here. This next project was sent to me by Bob Itnyre who came up with the 1/2" conduit lengths (written on each tube in the photo) that correctly tune them. Bob also researched what the best place is on each tube to touch the mounting brackets for the ultimate sound. As I was playing with the project, I noticed that mine didn't sound as good as his example because I didn't have the same rubber pads he had under each tube, and with no money for materials, I tried suspending them from rubber bands instead which actually made the tubing come alive with the most vibrant crystal clear sound (actually being better than the original project). The problem with rubber bands is that they have very short lives and break easily so I borrowed some sewing elastic from my youngest daughter and made the brackets with 1/4" dowels which stand high enough to suspend the tubes above the wooden base allowing them to have plenty of slack and vibration room to make them sound wonderful. There are tinker toy slots (cut with the scroll saw) on the top of each dowel. The elastic goes through with some sag at the bottom and slack but straight across the top. The slots have a dot of glue on each to close them up. They really sound terrific and they aren't difficult to make. Thank you Bob Intyre for sending me so many wonderful project examples. Whenever I have a little time, I get one out and begin putting my own twist on them. ***UPDATE*** 10-24-15 As people contact me to ask questions, I always manage to find the answers for them, even if I didn't find it out as I made the prototype which is what happened when I got a question about how we came up the musically tuned lengths. In this case when I was doing mine, I simply asked Bob who supplied the answer in 32nds. Maybe if I wanted to make this a larger xylophone with more notes, I would have needed to know where or how Bob got these lengths, but at the time I simply wanted to finish the prototype and make it sound as good as I could, and better than I was actually getting which is why mine ended up suspended with elastic..... thus my dilemma when someone later asked for clarification. Over 30 years ago (before the PC became common place in schools) I happened to meet a man who gave me dozens of lengths for cutting to actual tuned notes, but I never thought to keep them, and I never thought to ask him how he had gone about getting them. If it were me, I would think it might have been a little bit of trial and error, because I'm neither musical nor mathematical. One of my son-in-law's father tunes pianos with tuning forks, but without access to them, I would have to be at a piano. Cut it a little longer than you think you will need, then remove a little at a time as needed. But.... now that we have the Internet and google..... I found these. 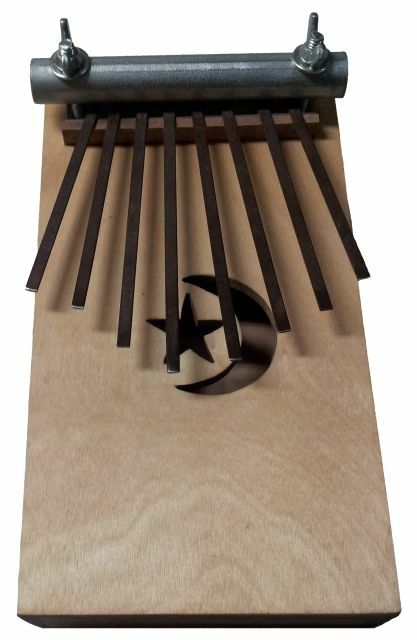 Chime tuning - Now this link takes you down into the middle of a page about wind chimes. 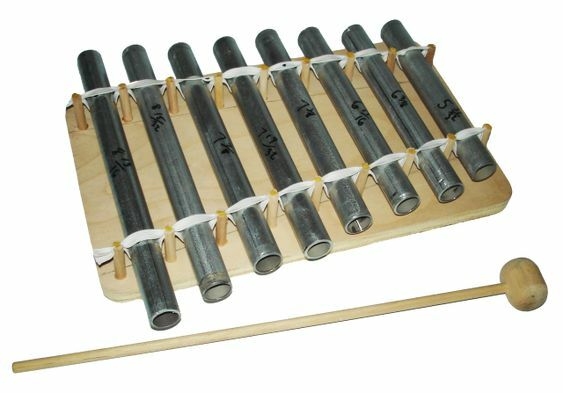 It's a very interesting page, so you might want to scroll up to investigate some of the science and engineering involved in making chimes work properly. There is freeware available for both I-pad or PC that allows you to precisely tune using a simple built in or plug in microphone. I guess it is still somewhat trial and error, with much more accurate results. In the past I have used the hacksaw to cut the conduit, but it leaves a really ragged (and dangerous) as well as inaccurate edge. That's the main reason I started using a tubing cutter. When I first started teaching I taught at a Junior high school. This was over 30 years ago, but we broke the class into several competing companies and designed a product to make for sale. 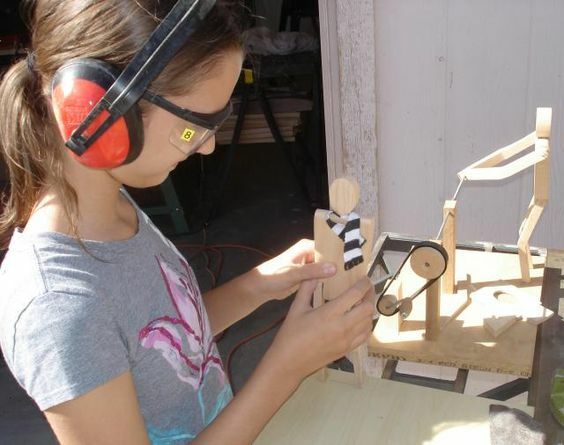 One product was a simple wind chime and I made 4 hack saw jigs of various lengths. 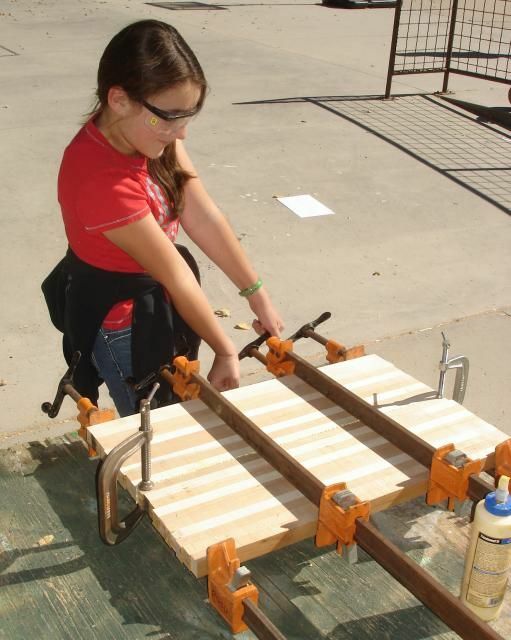 By the time we got part way into the build, the jig slots changed as the students simply could not be careful enough in how they were sawing. Now with a wind chime it really didn't have to have an accurate tuned chime, but my point is the jig slots suffered at the hands of inexperienced 7th and 8th graders. The project however turned out great and sold well. We ended up at the local pizza hut for a party (paid for by the kids) afterward and I tried to get this into the small town weekly local newspaper but never succeeded. 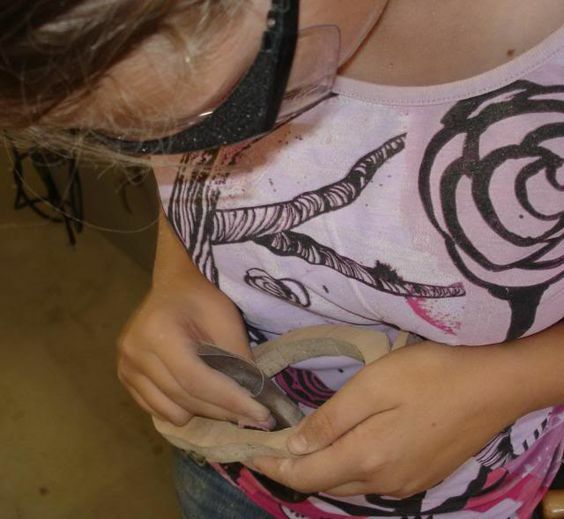 Now that we use the tubing cutter, I make the students go back in with a round file and knock down the sharp turned-in edge.... following that up with an emery cloth touch up or you could even use discarded sandpaper to smooth and finish a rounded safety edge. I really wouldn't want to hear about one of my wonderful student's, or their younger siblings getting their finger not only stuck in the tube, but what could happen as it gets pulled back out of a ragged edged tube. Bob does the same thing with a hand held reamer. 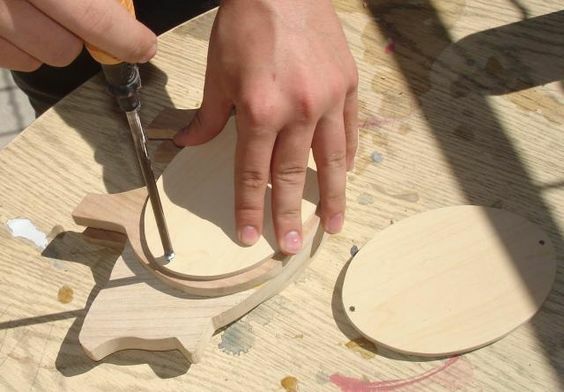 Anyway, to make that chore easier, we put the pegs into the base and then used a pull back cut with a back saw. After that the slots had to be turned 90 degrees because their final orientation is glued in the same direction as the peg line. We use either 1/2" or 3/4" for the base, whatever we have access to at the time. It's always a materials balancing act around here.... trying to hold back the 3/4" cast off scrap for special projects. I know how much time developing new projects takes, from inception to actual prototype, then a student run through still can find more issues. Bob certainly helped me get this one off the ground, especially with the tune lengths and even though it isn't our most popular project, it is still a very good one that is perfect for my situation. In fact, the school founders came in asking for us to make one to take to the other campus. ***UPDATE*** 11-20-16 I'm looking through old posts and realizing that some of what I've said really needs updating. This project has turned into one of the more popular projects. I buy bundles of 10 conduit at a time and I'm on my third bundle. 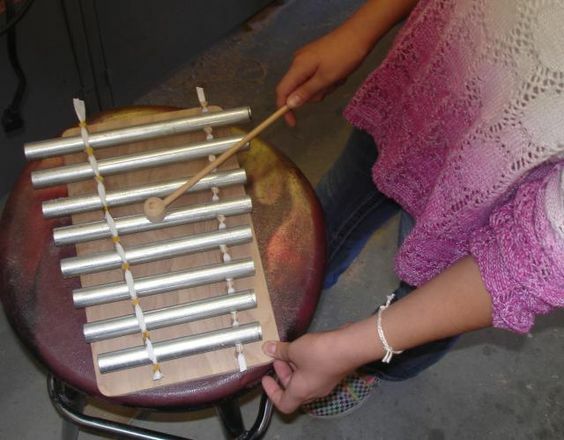 The xylophones cost about a dollar each to make. 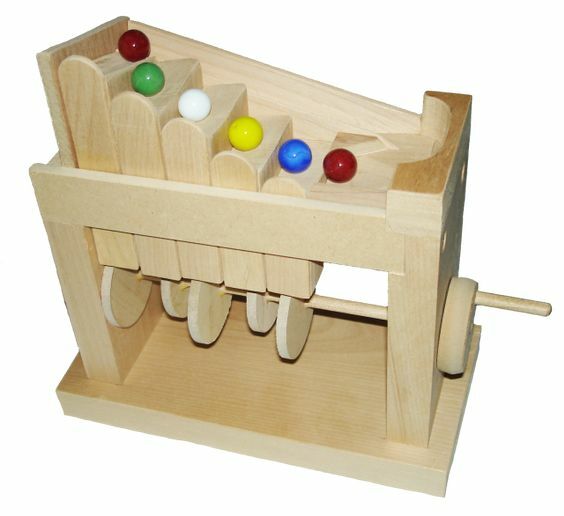 Yesterday I made the simple marble machine (video from you tube)... which I will simplify for my classes. For those who don't watch the video, the marbles go up the stairs when you crank it. 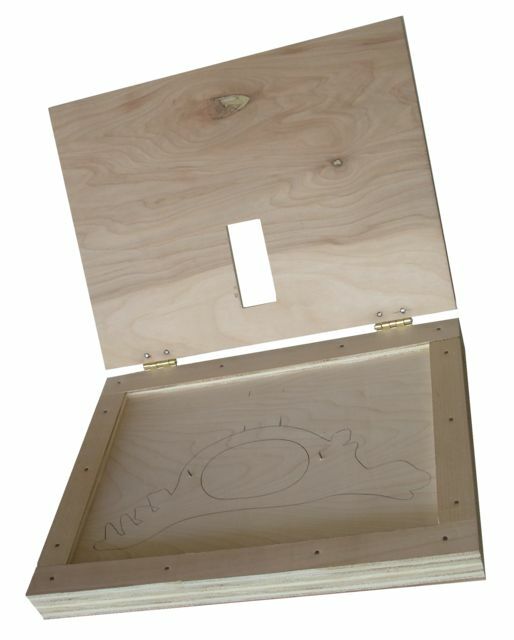 Here is the (Steve Good Scroll Saw Workshop plan). When I printed this pdf, the images shrank and the instructions weren't always clear. You can watch all three of his videos. Every other cam is set exactly 180 degrees in the opposite direction. There are other things on his site that I really liked and downloaded. I will show these later and pin point exactly where to go to get the downloads too. For those of you in other parts of the country, this story might come in handy. If you have my curriculum, you have already noticed how many times I refer to how your location in the country effects moisture content, thus... the use of wood joints... the way furniture is constructed... using adhesives... during the application of finish. Well, out here in the hot and dry southwest, wood moisture content can easily get down below kiln dry levels. This can be a pleasant feeling of personal comfort that is hard to achieve in places I've been where the humidity can be stifling. At least here you can still feel a cool breeze and it cools down at night. Not always the case other places I've visited. However, wood can be considered less stable here because the humidity (usually dry year round) can jump at times (like during summer rains). In a dry climate like this, an evaporative cooler is a cheap way to cool your house in early summer, but that extra humidity is not good for solid wood. Doors in old houses can stick, even if they are frame and panel construction. I've seen table tops grow 3/4" in width. That would be why this little marble machine worked great the day I put it together, but it picked up some of that moisture from evaporative cooling overnight and wouldn't work the next morning. The same thing happens to the cat automata I posted earlier. If I leave them out in the dry wood shop, it will work perfectly again. 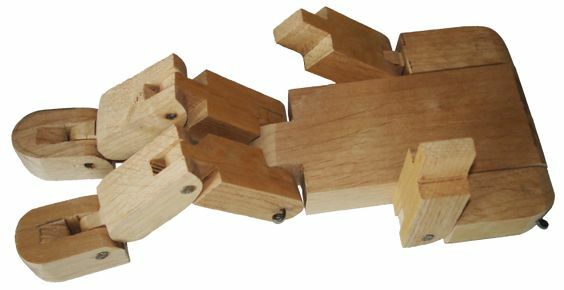 A perfect example of the movement of wood (shrink and swell). The MDF student prototype (currently held together with a single rubber band). I found at least one middle school teacher brave enough to attempt producing these in his after-school program (see video)... except... HEY TEACHER, WHERE ARE THE SAFETY GLASSES? A lesson in shrink and swell. ***UPDATE*** It's the middle of July now and has rained a couple of times rendering the evaporative cooler nearly useless. It has also caused the project to swell and seize up. I've disassembled the steps (pistons) and sanded them, thinning them enough for the machine to work smoothly again. I may have to do this a couple of times during the rainy season as the humidity fluctuates and then the project will be fine as the humidity declines. Around here, during the rainy season it may rain for a few days, then be dry for weeks and then rain again. Sometimes you can get 2" all at once. After the rainy season passes, you can go months (see article) without rain again. ***UPDATE*** It's the middle of August. We are three weeks into School and it has rained steady for a couple of days (with more on the way) now completely seizing up the marble machine. Our playground is under several inches of water. There are places nearby that have had over 4" of rain. And 90 miles away a major weather disturbance around some areas of New River (Cave Creek area outside of Phoenix) have had up to 6" of rain (about a years worth in one storm) with some of the worst flooding they have seen in years. I haven't had a chance to sand down the pistons again and the students want to know why the marble machine is not working. That is the perfect reason to go over shrink and swell again. In a few weeks the humidity will pass and everything will go back to normal.... at least for here it will be normal. ***UPDATE*** 9-8-14 So much for going back to normal. It has been raining a lot today. What they are calling the storm of the century blew through... some areas of Phoenix got 5.75" of rain in one storm... a single day... breaking a record that goes back to 1930. Seeing as how average Phoenix rainfall is only 6"-8", they certainly have had more than their share this year and whole neighborhoods are flooded. We... for the most part... share that weather pattern even though we are at a higher elevation with lower temperatures. ***UPDATE*** Everyone wants to start one of these, but I'm holding them back. The difficulty makes me want to wait until their skills are tested on simpler projects. I'd also like to keep it for 8th graders only. 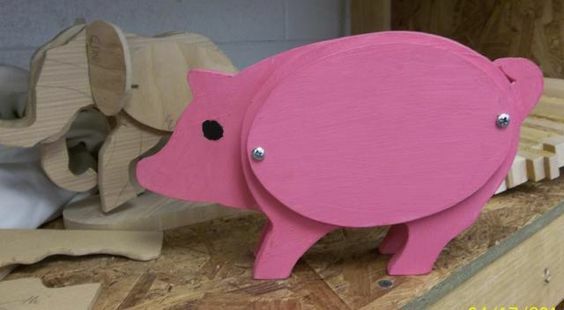 ***It's late October*** I have one eighth grader ready to tackle this project, the student (who makes the best scroll saw cuts ever) just completed the pink piggy bank for his mom. ***UPDATE*** Late March... OK, two 8th grade students have been working on this project and (partly because we meet only once every week and a half) all has not gone well for them. Parts go missing from time to time and they have had enough difficulties fitting parts to ask me the other day if they could bail out. I told them no bailing out please... that I am hoping they can finish. They are close to being done. Come on guys let's get it done. You can do it! ***UPDATE*** April 8... The first one completed. I knew she could do it and talk about a student feeling proud. It runs smoothly and just in time for the 21st Century auditors visit today. All the administrators along with the auditor were in the wood shop today after school looking at all the students have accomplished. 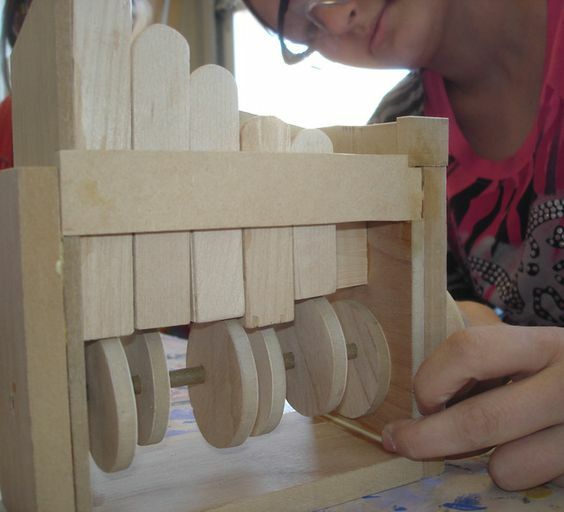 4-7-16 This marble machine was made by a 6th grade girl who amazingly finished making it in only 2 classes. It looks a little rough, but otherwise works. 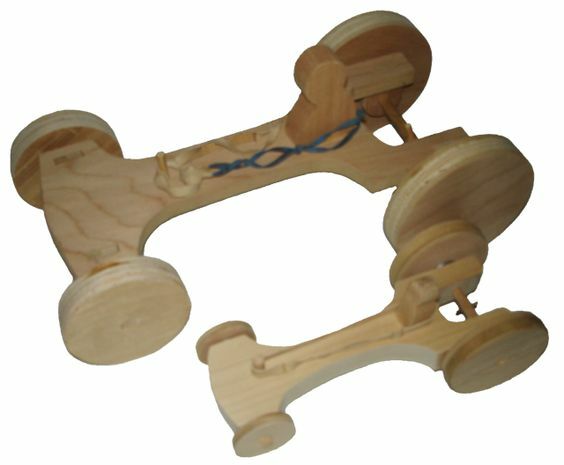 Today I worked on these rubber band cars. 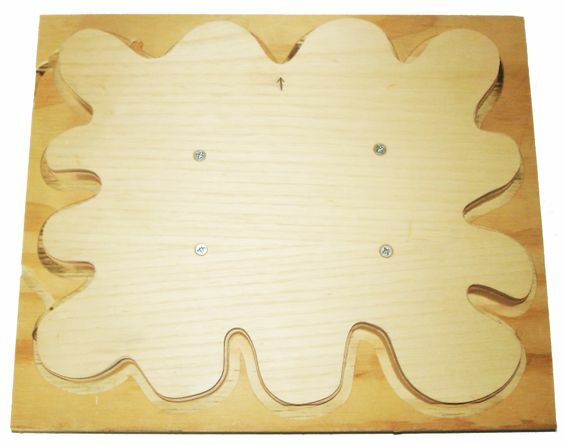 Here is a plan from Steve Good of Scrollsaw workshop for the smaller one, which peals out so fast (video) it makes the rubber band tires squeal like a real car on a slick surface. As you can see in the video, it doesn't go very far. I made the large one more like an all terrain vehicle (lift kit) and it does go further. 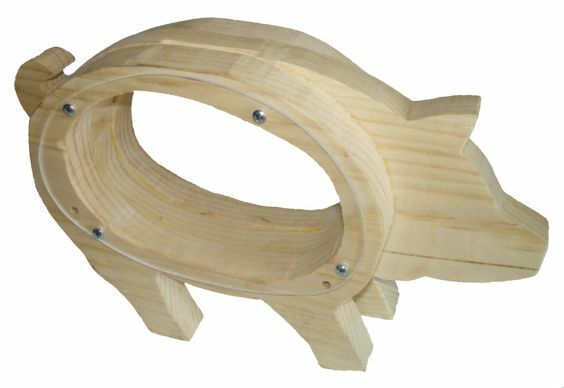 I guess the next step would be to cut treads into the wooden wheels and add a rubber band to the front as well, so it could do some four-wheeling. The easiest way to wind them up is to grab the left front wheel with your left hand and the right back wheel with your right hand, and then turn the whole car end over end being careful not to over-tighten the rubber bands. ***UPDATE*** I'm not real excited about this project for several reasons. First, the weather has the wood swelled up so much they won't roll, and second, the rubber bands need to be glued onto the back wheels. Yellow glue doesn't work well, and Gorilla glue changes (hardens) the rubber making the wheels act as if there is no rubber and thus little traction, but that hasn't stopped the students from wanting to make them. It's just too bad they don't perform as well as I would have liked. However, I'm surprised that it has not stopped the students from making them. You might be wondering why I have been focused on using the scroll saw. 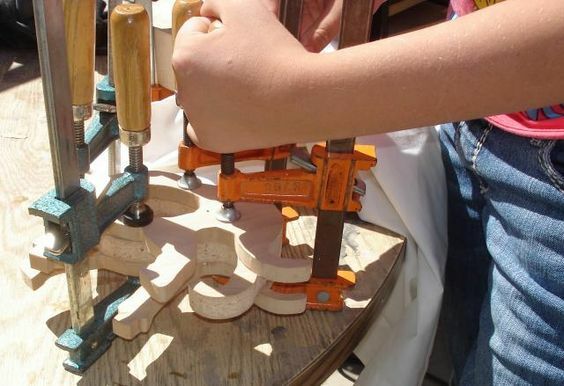 I haven't ever had the interest or desire to use or own a scroll saw, or to teach about the use of a scroll saw, but Franklin Phonetic School has a bunch of them and I really needed to develop projects the students might enjoy making in class. 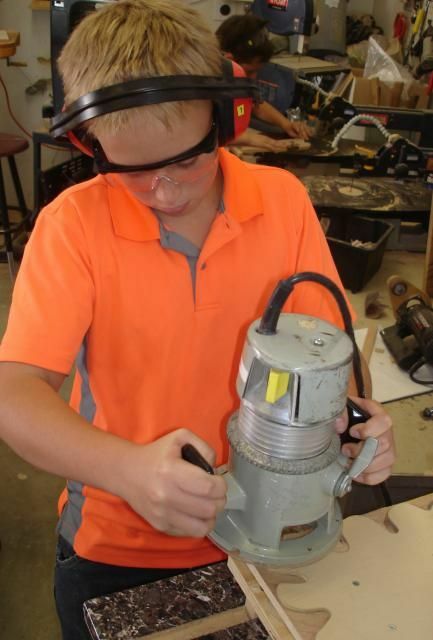 Several years before my first retirement I had a student bring one of these old Delta scroll saws to my school shop so he could use it on a project in class. 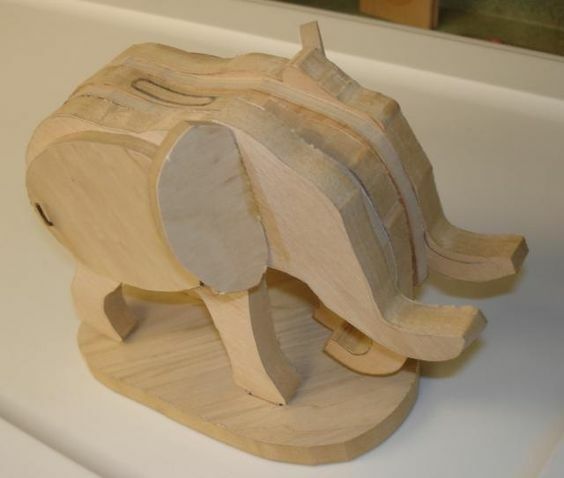 This photo was found on-line, (1944 Delta scroll saw) just like the one the student brought to school that day. His grandfather had passed away and left him so many tools and machines that their garage was over flowing. He said he was giving this one (to me personally) because he has another one just like it. It has a bunch of blades and misc attachments and is just like the ones from my own time as a student in the junior high school wood shop. It's one tough cookie and to think it sat on the shelf for years. I had to ask in disbelief... "Let me get this straight... you are giving me this scroll saw?" "Yes". After he was done using it, I disassembled it enough to get it home. It sat unused there for a few more years. When I retired, I found it to be way more useful then I ever imagined. It is the machine I have been using to develop many of the projects you are seeing in this post. I've been using the same blade for them all. To see more about my home shop here. The experience made me do a lot of research and that is where I found cheaper scroll saw blades that I can get by the gross, and also http://scrollsawworkshop.blogspot.com. Steve Good has a couple of simple software items you might be interested in trying out. The first one I really liked was the key chain maker. (see video) This photo shows about twice it's real size. 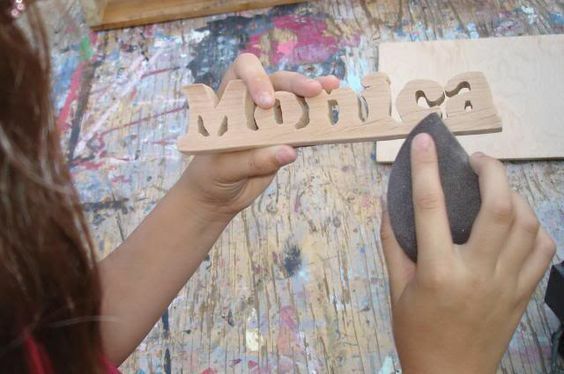 Monica (7th grade) puts the finishing touches on her name. Steve Good has a lot of other things that might interest you and downloads are available on his website. He asks for a small donation of $5. You can test it out and decide if you are really going to use it before you donate. He calls it donation ware. Of course if you use it, you would have to have a computer and printer for student use. ***UPDATE*** Late March... a mixed bag of results... depending on how skilled or (maybe) patient the scroll saw operator is will depend greatly on how well these turn out. For the most part, good, but as with anything, not always. ***UPDATE*** Late August... 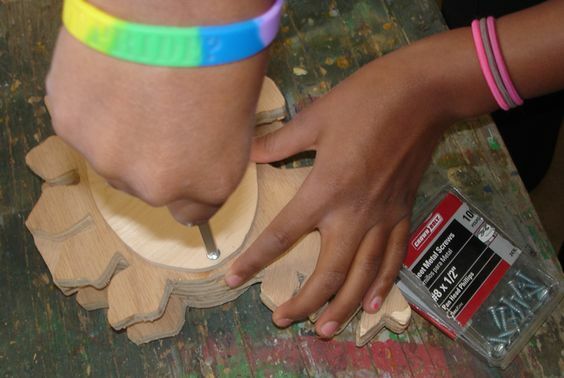 The 6th graders are practicing their scroll saw skills to find out which projects I am going to let them start, almost like a math placement test. This morning I saw this on lumberjocks.com and wanted to give it a try so I hand drew the lettering and cut it from both directions, although you can use this plan from Steve Good. Mine is about 5" long and has a fancier font. Even though I snapped my first scroll saw blade (metal fatigue), I didn't think it was nearly as difficult as I thought it could have been. I believe many of the students will be able to manage this project. 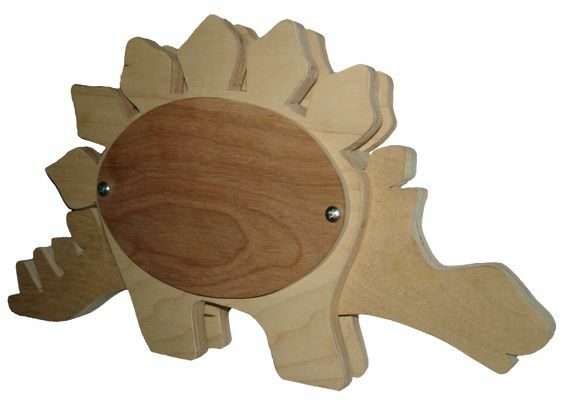 Check out all of Steve Good's scroll saw patterns. If you save them, then open them with Acrobat professional, you can delete some of the first pages so you don't waste ink and paper when printing them out. If you print directly from the website, choose only the pages you want. This saves toner and paper when photo copying them for your students. I plan to have a few patterns separated into skill levels for students to choose from and then see if they can actually make them. ***UPDATE*** Because this project is more difficult and requires thick material, I'm holding it off until later. If only I can find suitable (and free) material. What I can get free is used 2" x 4" material and I may have to just try it to find out if that will work. ***UPDATE*** I first thought this project might be a bit too complicated for a starter project, but the 8th graders are proving me wrong. So many of them wanted to start with this one that I let them and it is working out quite well. 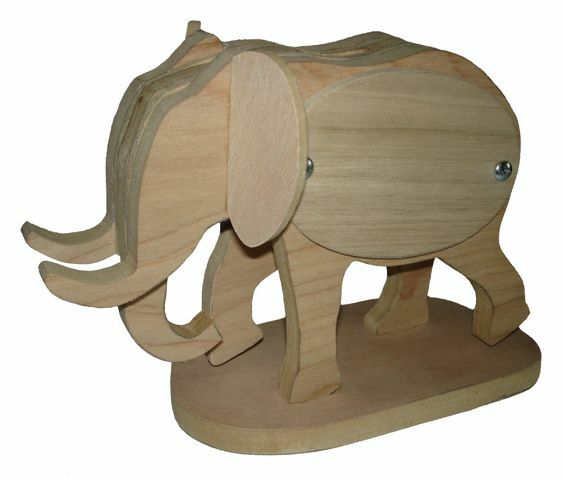 ***Early November*** Harder than it looks to build, this elephant starts to take final shape. The slot will be done on the drill press. 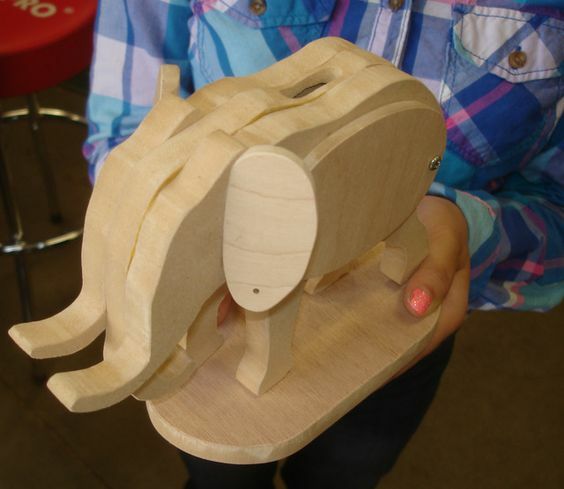 ***UPDATE*** 11-3-15 This 7th grader has completed one of the cleanest cut and assembled elephant banks I've ever seen. The photo makes it look as if it is much larger than it really is in life. The pierced ears will be able to hold earrings. This page was generated in 0.499 seconds.